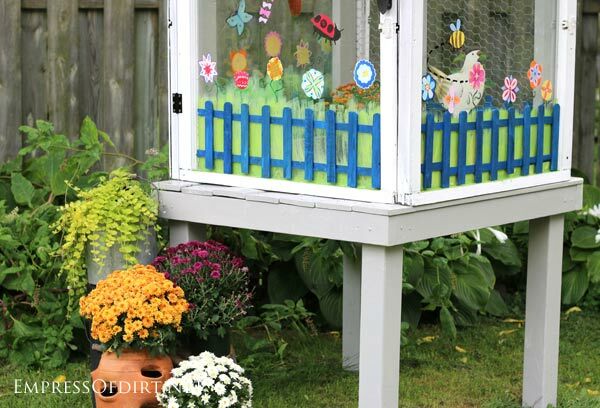 I made this mini greenhouse from old house windows found at the side of the road. Each window is a slightly different size, so I came up with a way to make framing easier. 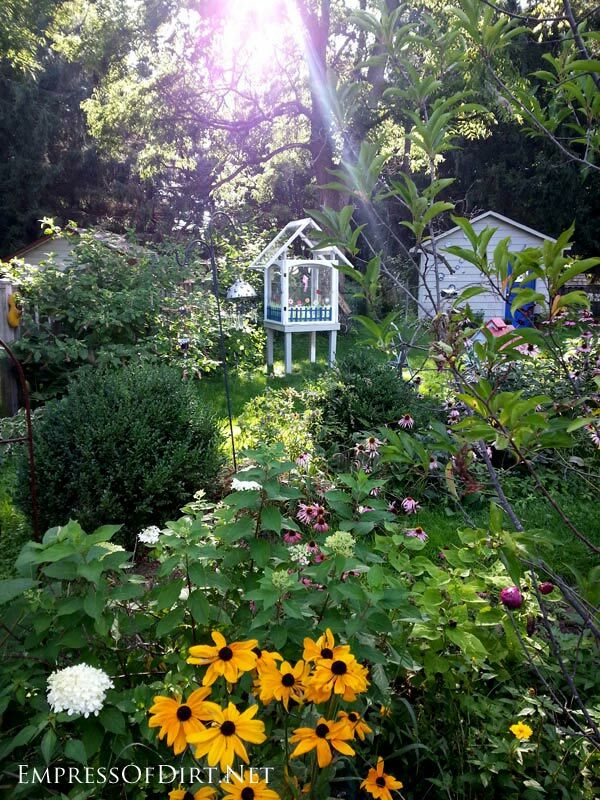 This tour of my garden shows the greenhouse and lots more garden art one year later. At last! I finally made my little window greenhouse. I found the windows on the side of the road quite a while ago and they have been occupying precious space on my covered patio ever since so it’s great to have it done. First, how many 35 x 42″ (ish) windows you can fit in a small hatchback car (without having to leave your companion) at the curb? For the record, the answer is 16. This project requires just 6 windows so I have 10 more to play with later. Here’s the problem. These windows came from a house built in the late 1800s. And every single window is a slightly different size, varying anywhere from .25″ to 1.5″ in height and/or width. That’s a huge variation to work with when you’re trying to frame something! After sketching out several different plans, and worrying that I was not thinking it through properly, I decided to build a very sturdy inner frame that I could attach the windows to. You see a lot of projects like this where the windows are simply joined to each other, but I wasn’t confident the wood was strong enough (could have some rot inside) plus, there was the problem of varying sizes. I might be able to join them together but they would be so far from square that it would look somewhat ridiculous. Even I have my limits, so the frame seemed like a good idea. I also wanted to create the roof with windows and these suckers are very heavy. 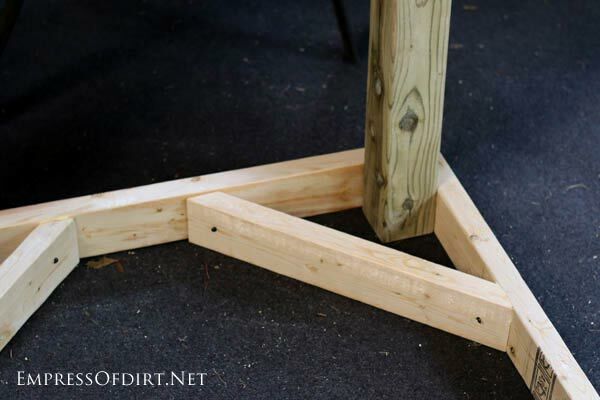 By creating a support frame, I could be confident that there would be no tricky joins or mishaps later. 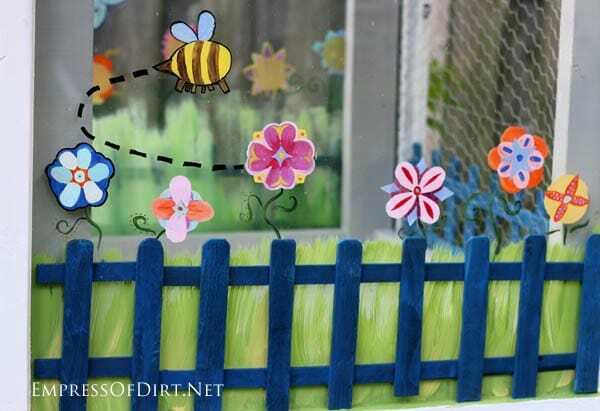 Related: Decorate a Fence with Faux Windows and Doors. 1. 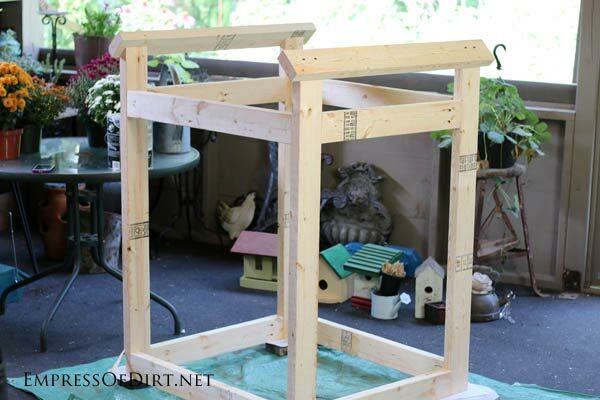 Build a table base to hold the window greenhouse. The height was determined by how much snow we get. I didn’t want the greenhouse to sit in wet snow for 6 months of the year so this way it’s 36″ off the ground. If it snows more than that, we’re all doomed anyways. The added bonus is that this height makes the entire structure visible from the patio, as it sits higher than most of the garden plants in front of it. 2. 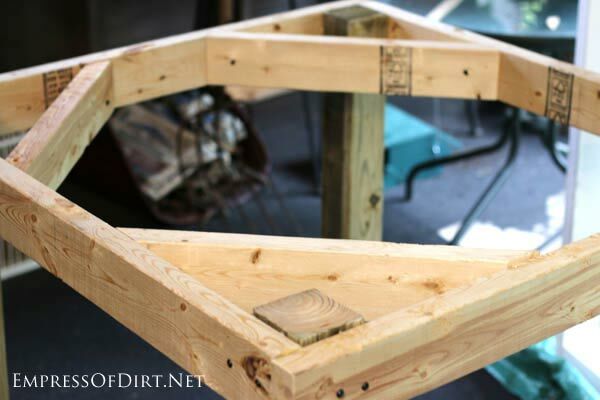 Build a frame to mount the windows (sides and roof) on. Truthfully, my main goal was to build something really cute and quirky. 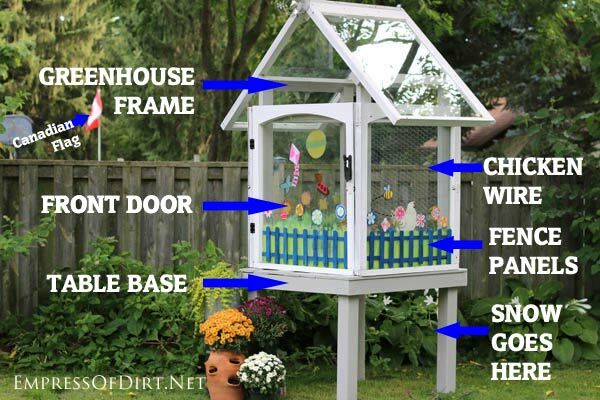 The fact that it has a door that opens and closes and can house delicate plants is a bonus. 3. 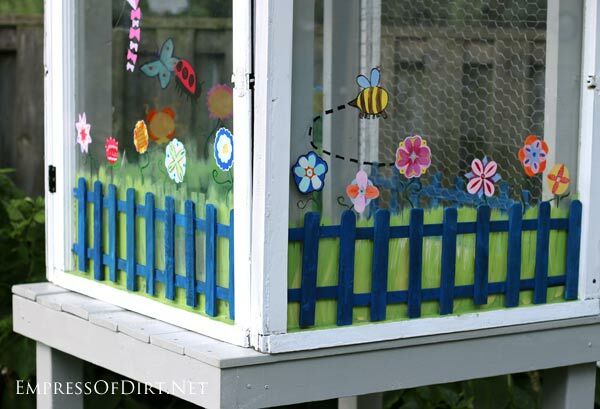 Paint and decorate windows. First, of course, I had to sand, repair, prime, and paint the windows. 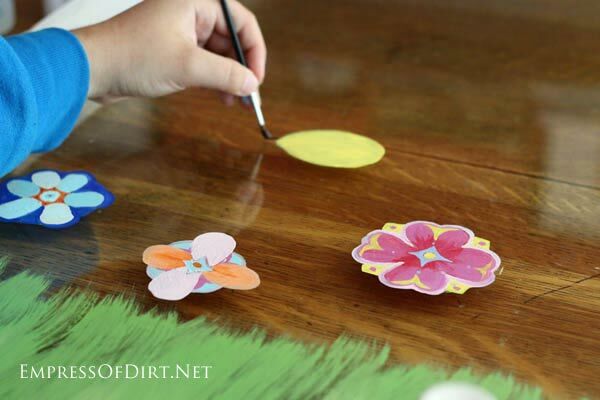 Then came the fun stuff—decorating the windows with glass paints. There was one unfortunate event which you’ll hear about…. 4. Assemble structure and admire. As you can see with the completed table base shown here, it’s a simple structure designed to be very strong and sturdy. Since the windows were already a mishmash of sizes, I opted to buy wood from the seconds pile at the lumber store to keep costs down. As you can see in the photos, I formed a square frame with the outer 2×4 pieces and attached the legs to the inner corners. Extra 2×4 pieces with 45° miter cuts were attached to make it really secure. The 1×6 table top boards (not shown) were cut to fit on top of the frame. Once the table top was added, it became very sturdy with no wiggle room. Again, I knew the greenhouse would be very heavy so this baby had to be strong. Now that the table base for the window greenhouse was built, it was time to create a structural frame to hold the windows in place. I’m obviously not a carpenter (nor do I play one on TV) so it took a lot of thought (my poor brain!) to come up with (what I think is) the best way to build this. My main concern was sturdiness. If it could be good-looking and very solidly built, I’d be a happy camper. And yes, as it turned out, I’m a happy camper. 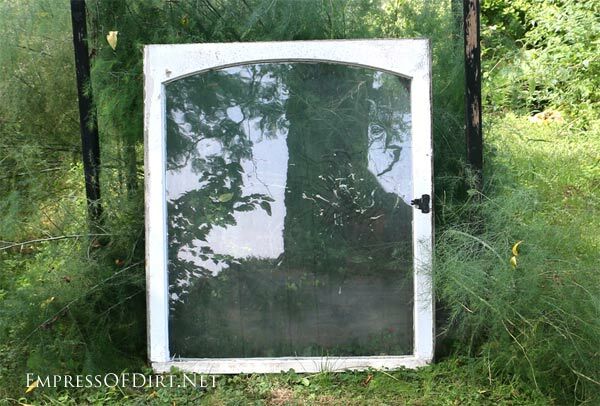 If you’re just joining in the story, I’m making this mini greenhouse from old, wooden windows found on the curb. No two windows are the same dimensions and neither are any of them actually square, so it’s a building challenge to say the least. I made the sides to match the average width and height of windows (which are odd sizes and not square). Notice the height: I cut the vertical pieces extra long to allow room for the roof windows to hang down without blocking the sides of the greenhouse. The tops of the vertical 2x4s are cut at 45° angles. This allowed me to join the roof windows at a 90° angle (= 2 x 45). 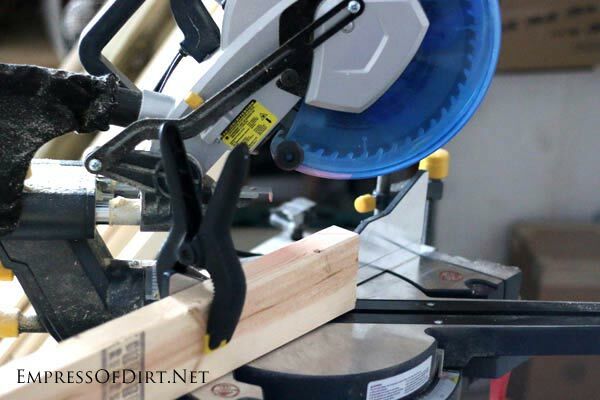 I got this dual bevel sliding compound mitre saw (with laser) at an excellent sale (see one here ) and what a great tool it is. Mine has a 10″ blade. If you have a choice, I’d go for a 12″ blade so you have just a few more options for the size of wood you can cut. It truly just takes seconds to set up the mitre cuts and the laser guide makes it so easy to get right every time. This is where the project got really fun. I finally used my Kreg Jig K4 Pocket Hole System . 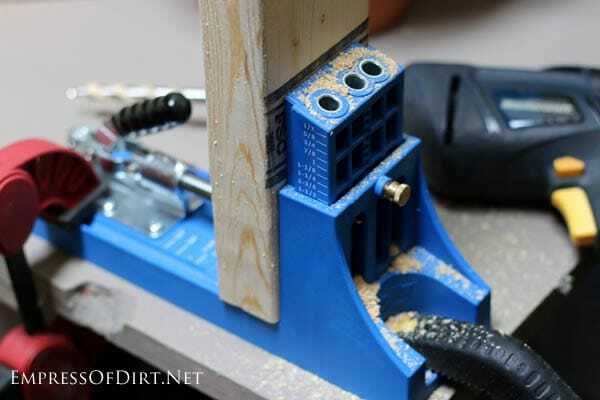 It’s a drill guide that lets you create perfect pocket holes in wood. It’s simple to use. 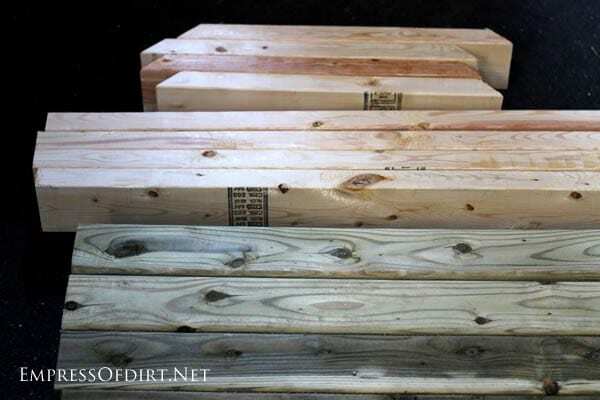 You just need to know which size wood you are using (I used 2x4s) and the Kreg system tells you which size screws to buy and where to drill the pocket holes. It takes under a minute to create the holes and you’re ready to join your pieces. 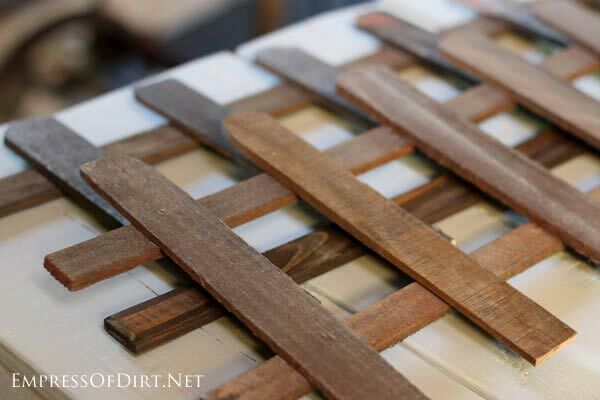 Using self-tapping screws (and some wood glue), you can join wood pieces together very snugly and securely. Once you use one of these jigs, you’ll want to make all sorts of things! It’s quite fabulous. In the photo (above) you can see the self-tapping screws have been placed in the pocket holes, ready to be drilled into the adjoining piece of wood. No pilot holes required. If you’re a geek like me, there’s a mini thrill to be had when you hear this little squealing sound the screws make when they’re placed just perfectly. Love that! As I was assembling the frame, I also sanded all the edges with the palm sander so it was smooth and ready for priming and painting. 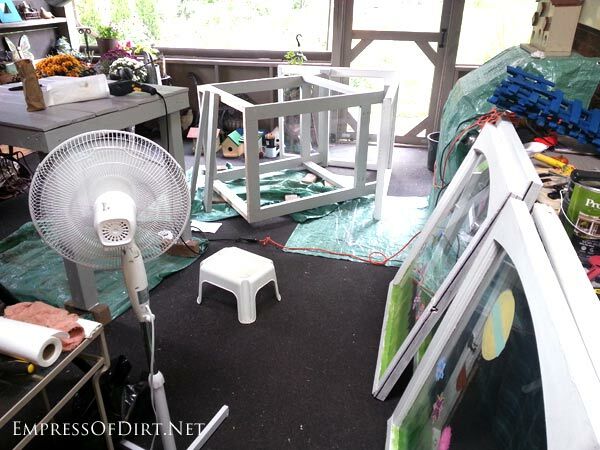 With the base table and greenhouse frame built, it was time to get the windows ready. This is where we had a wee mishap. The old windows had many coats of paint and lots of layers of caulking holding them together. I removed what I could, sanded, primed, painted and sealed everything to make them strong enough to hold up in our weather extremes (-20°C to +40°C). Funny how the mind works…. I saw these little, decorative fence panels in a shop and thought they’d look sweet on the windows. This was what actually spurred me on to get this project built! Once you have a vision of what you want to make, it’s so much easier. I painted the fence panels blue to match the shed door, hoping it would unify the look of the garden (I think it does). We* used an assortment of craft paints suitable for painting glass including these Martha Stewart Crafts Satin Paints . I had not used these paints before and they go on really nicely. But they are expensive (thankfully, we used a 50% off coupon at Michaels) and the ones in the smaller containers don’t provide a lot of paint. I soon realized I should not be cleaning my brush so much between colours because I was wasting precious paint (instead I tried to use up what was on my brush first). *I started out painting the windows but my daughter soon took over. I love it when that happens. When all the windows were painted and I was getting ready to take them outside, Bobo (we were cat-sitting) jumped onto one window, knocked it over, and the glass shattered. We actually had a laugh because the window she broke was the only one I had painted! Everyone’s a critic. I didn’t want to pay for a new piece of glass but I had to use this particular window because I built the wood frame to match it (and none of the other windows are the same size). 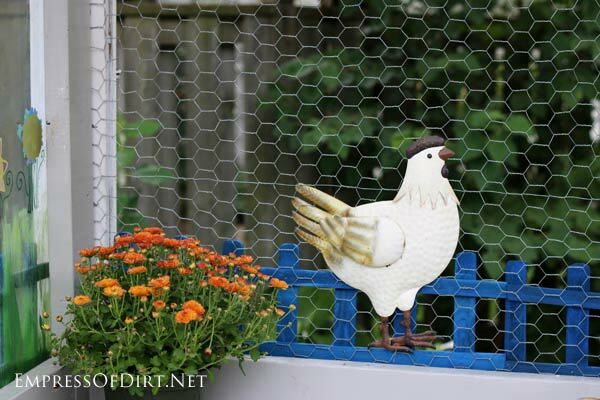 So, I opted to use chicken wire instead. 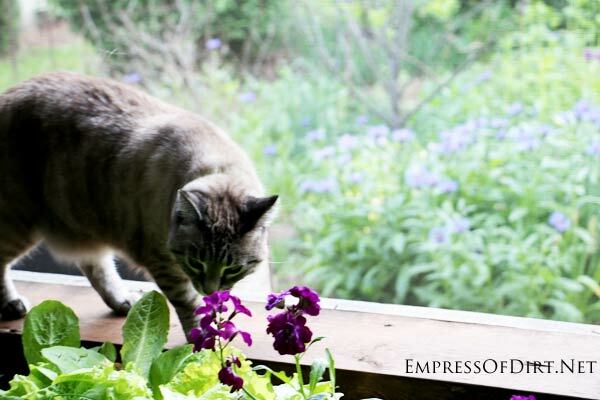 It’s the window that is placed at the back of the greenhouse so it works just fine. One minor disappointment was, we had painted a series of clouds that continued from one panel to the next, and this broke my main clouds. Boo-hoo, I know! Seriously, it was just a mishap and I do not blame Bobo. She was just being her Bobo-ish self (which I adore). Here’s a quick review before we put this all together. I built this table base to be super strong and withstand our crazy weather through many seasons. The 4×4 legs are pressure-treated, the rest of the wood is not. I sanded, primed, painted, and stained to match our garden shed. I could not find any examples online to follow so I made up my own plan for this frame. I needed something really strong (stronger than the windows) that would hold up to wind and weather. I attached the 2x4s together using pocket hole screws (and my Kreg K4 pocket hole jig, that I adore), sanded, primed, and painted. It’s very sturdy! The old windows needed some TLC including removing old caulk, sanding, priming, and painting. 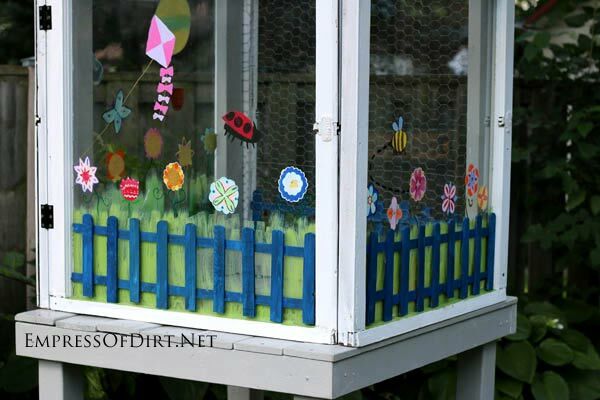 We used acrylic craft paints suitable for glass to decorate the windows. I came up with the design I wanted, painted one window (which was accidentally broken by the cat), and my daughter did the rest. 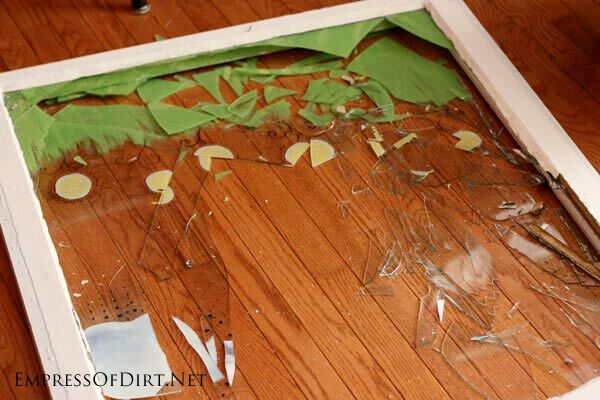 The broken window was brought back to life with chicken wire in place of the glass. I added some decorative picket pence panels as well. I attached them to the windows using Goop. Any strong, all-purpose adhesive will do. If you’ve been following this story from the beginning you’ll know that I mentioned I did all of the building in our covered patio (so I wouldn’t be at the mercy of the weather) but this also meant I had to make sure everything I assembled could still fit through the door. Well…. as I was working, I began to see how the fact that windows were not square was starting to throw my measurements off. It was one thing to accommodate the various lengths and widths, but this did not compensate for the odd shapes of the actual window frames. Long story short, the greenhouse frame got through the doorway with about an eighth of an inch to spare! Worst case scenario, I would have had to take it apart and re-assemble it outside, which is no big deal, but it was a lesson to think about with future projects from repurposed items. I actually buried a few inches of the table legs in the ground for extra support. 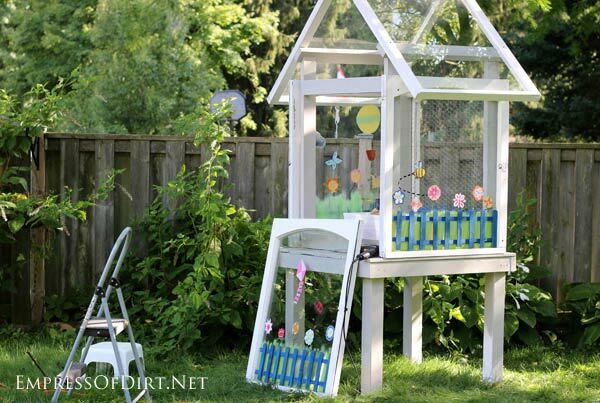 The greenhouse frame was secured to the table using L brackets. 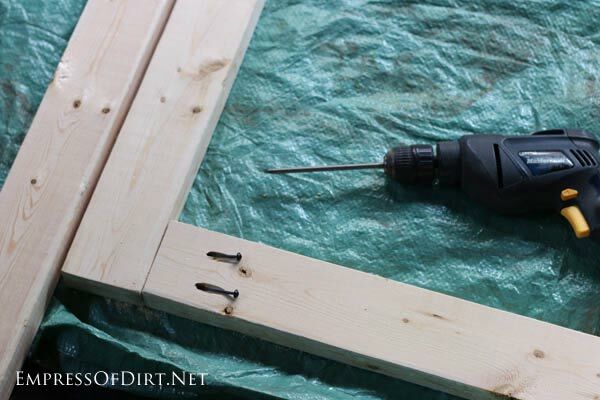 I made pilot holes through the window frames and attached them with self-tapping screws. 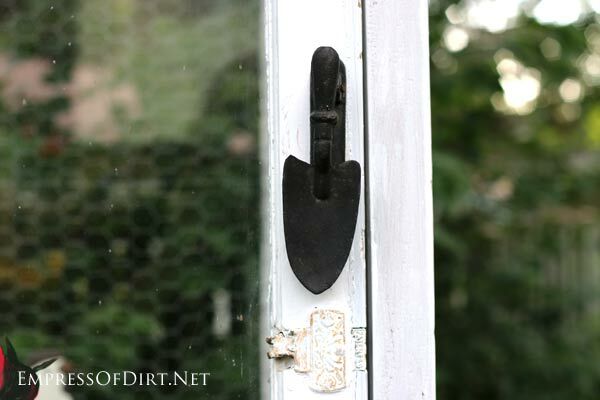 The front window was made into a door by attaching it with two metal hinges. I pre-assembled the roof using a 2×4 on the interior join and a 2×2 on the exterior join. It was definitely a 2-person job to lift it up on onto the support frame. I’m intending to add some metal flashing over the top when I find what I need at the thrift store. I like to take my time and find just the right accoutrements (at the right price) at thrift shops so it may be a while before I find the touches I want. For now I stuck a metal basket at the front peak while I think it over. 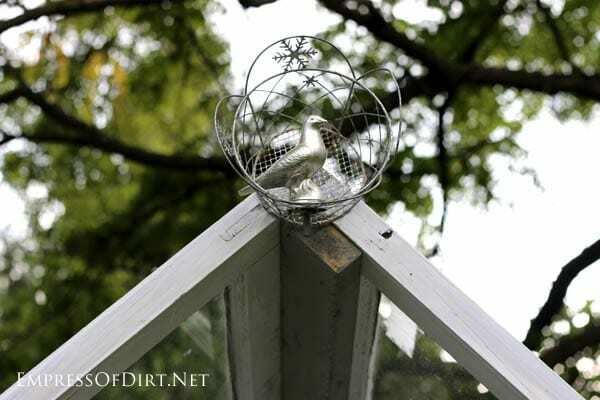 The metal bird came from a thrifted pigeon racing trophy (! ), reminding me of a very sweet bird that adopted us for a while (you can see the story here). A few years later I added a thrify green roof. You can read about it here. 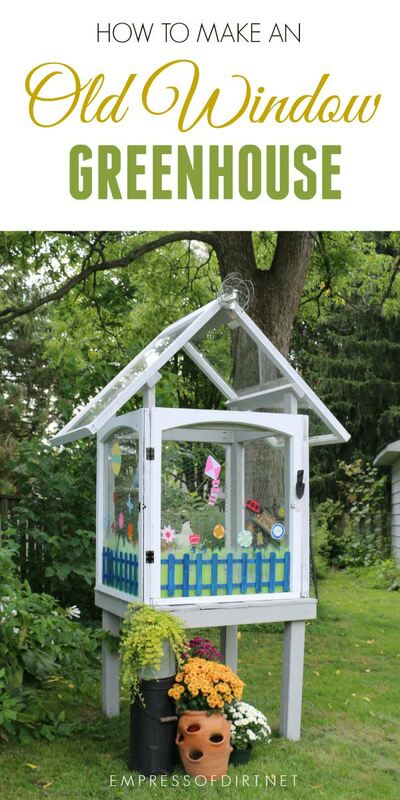 I just love this little greenhouse and would love to have one. I chuckled at your plan drawing where you point out the Canadian Flag and the spot for snow. Your directions are very clear and should be easy to follow if I can get my rear in gear to do it. Thank you for your very interesting and informative Newsletters. Thank you, Sharon! And I’m glad you enjoyed my evidence of residing in Canada. You’re welcome! If you make something with them, I’d love to see it. What a fantastic project! 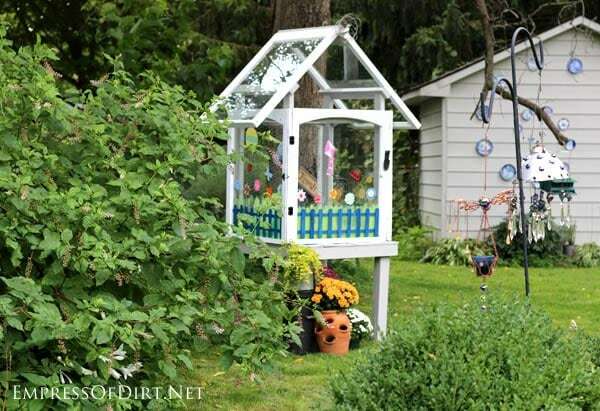 I’d love to have one of those in my garden too – both cute AND practical. Thanks, Tanya. It was a lot of fun to do. Now I’ve got build-something fever!